I believe our bodies both benefit and function better by being leaner, stronger, and properly balanced through fitness conditioning. Each person’s fitness journey is unique to them and is marked by a beginning goal and it is accomplished one step at a time no matter the starting point. It is my goal to provide each person with the fitness knowledge and tools to help them achieve their goals in the best time frame possible. 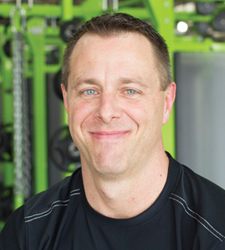 Chuck studied Kinesiology at Kansas State University and has over 15 years of experience in the fitness industry. He specializes in functional strength training, body composition change, martial arts and sport specific training. Chuck’s favorite aspect of Personal Training is helping people feel better and enjoy an enhanced quality of life through improving fitness levels.